At the start of October I wrote about the Leafy Hollow Cottage we’d come across entirely by chance. As I noted at the time, for those looking for a reasonably sized cottage with plenty of scope and which has some charming features, it really is just the job. Since then the rest of our little island home have been undergoing a face-lift and a “bit” of re-arranging, largely thanks to Alex Bader (as always!) and Mandingo Quan, with assistance from Cory Edo and Kriss Lehman. In particular, the wooded area now has Mandingo’s Summer Trees rather than Alex’s Scots Pines. The former are more in keeping with the intended theme of the estate, and they give exactly the foliage cover I was seeking for the southern end of the island. They are also low impact and low rendering cost. However, Alex’s Enchanted Wood is still used to give a nicely uneven ground layer with path winding between the trees and through the ruins, with undergrowth and plants from a number of his packs providing a suitable blanket of flowers and foliage as the path winds up towards the cottage. One of the problems we had in changing things around in October is the island ended up being a place of two halves which didn’t really blend: the cottage and its terrace and lawns, and the “wilder” wooded area. Enter Alex’s Ancient Stone Wall building set. It’s made the perfect divider between the more “curated” gardens around the house, and the more overgrown woods. The dry stone design (we think) sits nicely between the modern design of our tiered lawn of the garden and the rougher, more aged stone of the old chapel and ruined keep, which both now sit in the middle of the woods. Cory Edo is another of my favourite designers; in the past I’ve made use of things like her Rustic Pavilion, as well as still using her indoor and outdoor furniture. One of the things I particularly like about her work – besides the fact it a well made – is that it is nicely modifiable: Cory seems to go that extra mile to allow many of her items to be modified with textures and materials across faces where others might be tempted to use a single face to represent difference surfaces of their models. For our redesign, we turned to Cory’s Keliana Pool (no marketplace listing) and Dorina Outdoor Hangout. When put together (with a little bit of modification!). These have made an ideal outdoor area for entertaining friends, rounded-out by a hanging chair from Mandingo suspended from Alex’s Twisted Tree which enjoys widespread popularity among region designers. Having dug out my copy of Alex Bader’s Willow Pond, it was obvious some wildlife would be needed. For this I turned to TLC, who offer a great range of fish, birds, ducks and so on. The prices are exceptionally reasonable. The TLC swimming ducks are superb: low impact, a good price, and so easy to set up on any kind of water. The Mallard family of ducks arrived first. Eoth copyable adults and ducklings, swimming and static (in a nest), I really cannot recommend them highly enough. The swimming versions work on both linden Water and “artificial” prim / mesh water, and set-up is an absolute breeze. 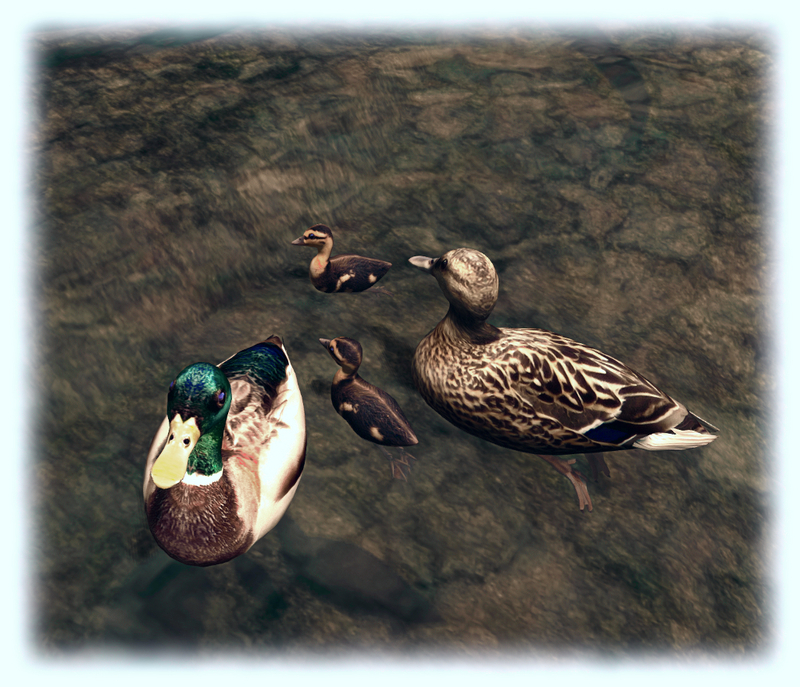 You’ll likely fine the adult duck may need resizing a little – they’re slightly on the large size for “normal” sized avatars, but this is also easily taken care of. Fish, and possibly a woodpecker are likely to be next in line 🙂 . With our new beach to at the north end of the island, moorings for our matched pair of floatplanes,and the boats nicely docked to the south, we’re once again ready for a spot of quiet living, and I’ve promised Caitlyn that, other than tweaking, the hard hats can be put away again 🙂 .